The Confirmation Process is open to all teens who are in high school. 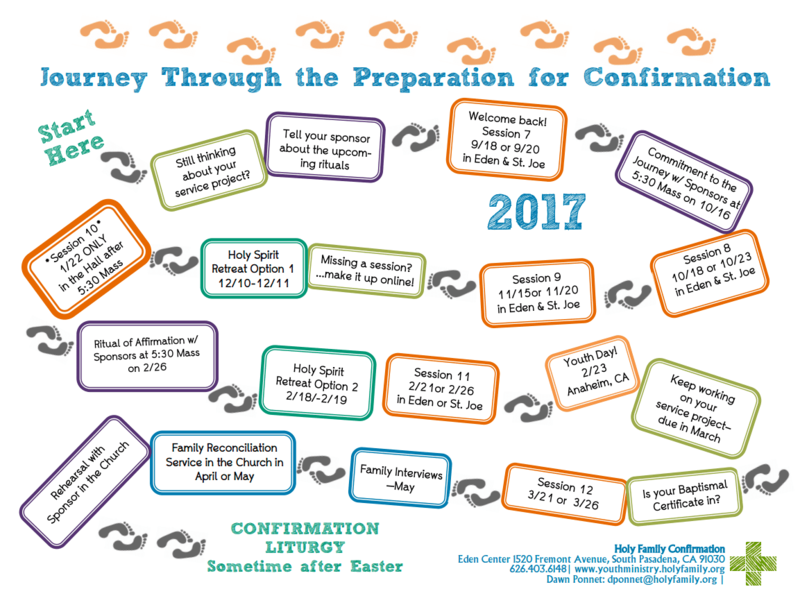 Catechesis: The candidate and his/her parent(s) are required to attend six 90 minute sessions per year. Sponsors are invited to come if they are local and able to attend. If one is unable to come to a session there are makeup post on this site. Service: The candidates and their families are asked to put their faith into action by participating in one large or several smaller service projects. It is difficult to calculate hours for projects, however the projects should be about five hours per year. It is our hope that these projects include the whole family. See the service post for opportunities. Community Life: Being engaged with other teens in the process coming together fun social activities is all a part of the confirmation process. Candidates will be asked to participate in two Community Life events each year. See the Youth Ministry Calendar for opportunities. Retreats: Often the highlight of the Confirmation Process is the retreats. Candidates are expected to attend at least one retreat each year. See the Retreat post for opportunities. Rites: The candidates and their sponsors will ask the larger community for the prayer and support at three rituals throughout the Confirmation Process. See the Rituals Post for the calendar. There is a $300.00 fee for the two years of Confirmation Process. However this does not cover the retreat nor any other outing which requires a fee.